NEW ORLEANS – While the top teams on both the men’s and women’s sides might have remained the same that doesn’t mean there wasn’t a ton of action throughout the rest of the charts in the latest edition of the NCAA Division II Indoor Track & Field National Rating Index released by the U.S. Cross Country and Track & Field Coaches Association (USTFCCCA) on Tuesday. The Ashland men and the Grand Valley State women held steady as the top teams in the country. 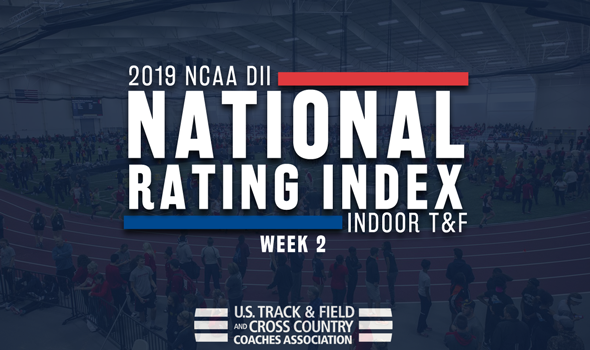 The men’s ratings as a whole saw two new teams jump into the top-five while the top-three teams on the women’s side of things all held in their previous ratings. Remember: The 2019 NCAA Division II Indoor Track & Field Championships will be held March 9-10 in Pittsburg, Kansas. Holding down the top spot in the nation for the second week in a row is No. 1 Ashland with 187.38 points after yet another strong showing at the both the Findlay Alumni Classic and the Penn State Nationals. Top times posted this past weekend by the group came from Myles Pringle (tops in the nation in the 400 at 46.12), Trevor Bassitt (is right behind him in the same event at sixth overall with time of 47.61) and Nick Zak (third in the weight throw). The 4×400 relay is also third overall in the nation after running a 3:12.97. Ashland held the No. 1 spot for the first seven weeks of the 2017 season. Moving up one spot to No. 2 from No. 3 was Tiffin with 141.46 points after a solid field showing at the Pittsburg State Invitational. Top performances from the weekend belonged to Davis Bowers (fourth in the pole vault at 5.14m/16’10¼), Toryko Grace (fifth in the weight throw at 20.30m/66 7¼) and Eric Johnson (eighth in the shot put at 17.74m/58-2½). Dropping a single spot was No. 3 Adams State after collecting 132.93 points. The Grizzlies were off from competition this past weekend and will next go at the Colorado Invitational this Friday and Saturday in Boulder. The sprints/short distance and distance runners have had strong starts to the season for the group. Climbing five spots to No. 4 was Central Missouri after multiple athletes had career days at the Pittsburg State Invitational. They picked up 97.35 points in this week’s ratings. Top weekend performances came from Vincent Hobbie (ranked No. 1 in the pole vault at 5.34m/17-6¼), Jan Jansky (fourth in the pole vault at 5.14m/16-10¼), Brad Jenkins (sixth in the triple jump with best of 15.05m/49-4½ ) and Nathan Cummings (seventh in the shot put at 17.76m/58-3¼). The 4×400 relay also posted the fifth-best time in the country with a 3:14.24 performance. It is the best the program has been ranked since the Week 5 ratings back in 2011. Ascending six spots to No. 5 was Colorado Mines with 89.08 points after competing at its own Mine DII Invite & Multi event. Standouts from the weekend include Connor McLean (ninth in the pole vault with a best of 5.05m/16-6¾) and the DMR unit that now leads the country after post a converted time of 9:46.17. Rounding out the top-10 was No. 6 Grand Valley State (88.63 points), No. 7 Academy of Art (86.74), No. 8 Findlay (83.97), No. 9 Angelo State (73.94) and No. 10 Minnesota State (70.62). The largest improvement made this week came from No. 31 Wayne State (Neb.) who shot up 53 spots. In total, 22 of the top-25 teams experienced some kind of movement. Four previously unranked teams also joined the ratings, led by No. 64 MSU Denver. For the third consecutive week, Grand Valley State has commanded the No. 1 spot. The program leads the ratings by more than 112 points. The Lakers registered 249.77 this week after competition at the Can-Am International meet. The top performer of the event was Angelica Floyd who posted the fifth best performance this season in the long jump at 5.81m (19-0¾) and added the sixth-best showing in the 60 (7.55) to join the numerous Laker athletes that have nationally-ranked performances early in the year. Holding in the No. 2 spot was Adams State with 137.69 points after an off-week from competition. The Grizzlies will next be in action at the Colorado Invitational this Friday and Saturday. Top performances have come across all disciplines from this group as the sprints, mid-distance, hurdles and distance athletes all have nationally-ranked marks. Also experiencing no change was No. 3 Lincoln (Mo.) after it received 128.41 points. The Blue Tigers competed at the Jayhawk Classic and added new national leaders to the mix. Rene Medley posted the top time ran so far this year in the 200 (24.09 converted) and Kissi-Ann Brown added the seventh best time in the country in the 400 (55.18 converted). Bumping up one spot to No. 4 was SF State with 100.70 points. The Gators took part in the UW Invitational this past weekend and saw top performances out of Destiny Mack-Talalemotu (ninth in the weight throw) and Bianca Bryant (tenth in the 800) while the 4×400 team now ranks second in the nation and the DMR slots in eighth. Rounding out the top-five was No. 5 UC-Colorado Springs with 97.86 points after competition at the Colorado Mines DII Invite & Multi. Jada Carr joined the Mountain Lion nationally-ranked athletes with a ninth-place performance in the triple jump. Completing the rest of the top-10 was No. 6 Lewis (92.81 points), No. 7 Alaska Anchorage (79.26 points), No. 8 Azusa Pacific (73.51 points), No. 9 Indianapolis (67.39) and No. 10 Missouri Southern (64.52). The biggest gain in the poll belonged to Embry-Riddle (Fla.) after a 64-spot improvement. Simon Fraser also shot up 46 spots to come in at No. 14. It was a new program best for Embry-Riddle and was the best mark received by Simon Fraser since being ranked in the same position in Week 7 of the 2015 season. While the top three teams remained steady, 21 of the top-25 teams saw some kind of change from the previous rating. Eight new teams also joined the ratings with the highest ranked of those being No. 62 Lake Erie.